I get asked to test out all sorts of foods and products, but I can only say yes if I can imagine actually eating or using them. When Crank's asked if I'd like to sample their organic wholemeal loaves, I could see how this would go down. I work on a hungry team. We have a massive biscuit box (my doing), deal with cakes in seconds and love a bit of breakfast to set us up for the day. I was already dreaming of freshly buttered toast with some decent raspberry jam. Yesterday morning I delivered platters of this lovely bread in various guises to the team area. Cue a swarm of hungry workers... They came from all over the office after sniffing out our toast! Because we're a lovely little lot, we shared it out as we had plenty. The result was one very happy office. 'NOM' (when asked to expand...) 'NOM NOM'! Yes. So there you have it baking folk at Crank's! Turns out that a hungry tribe of Business Development Managers and their pals approved whole-heartedly. Our recommendation? Get it toasted with jam. Every Thursday we take it in turns to bake at work. It's our new thing. 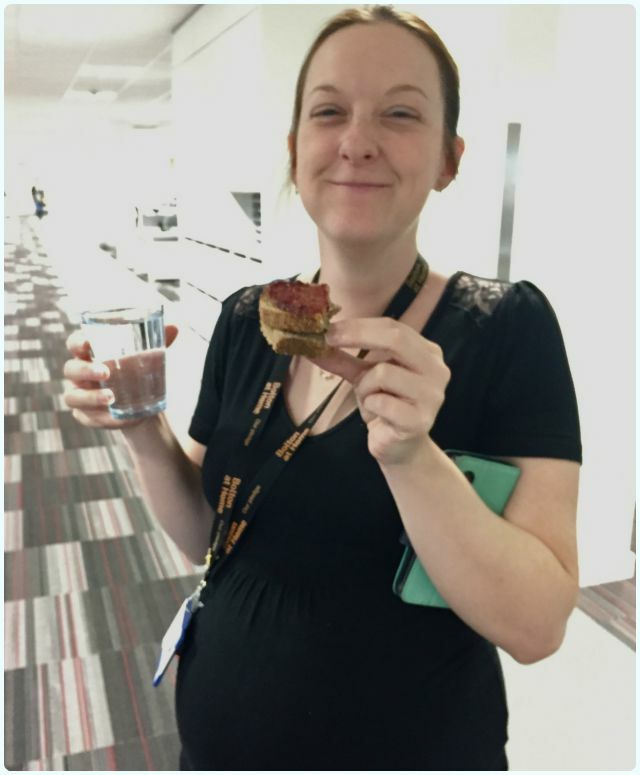 Last week, Phil made a corking double layered carrot cake, and this week the baton was passed to me. This shiny little number attracted folk from all over the office like a flock of magpies. Luckily, this is a massive cake, so there was plenty for everyone to try a bit. 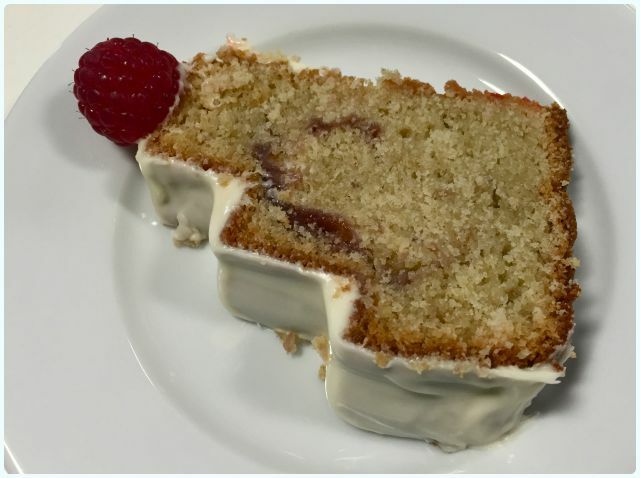 The cake itself is a raspberry sponge with a little ripple of jam running through. This means it's got an incredibly soft crumb and stays ultra moist. The addition of the white chocolate covering just adds to its charm! 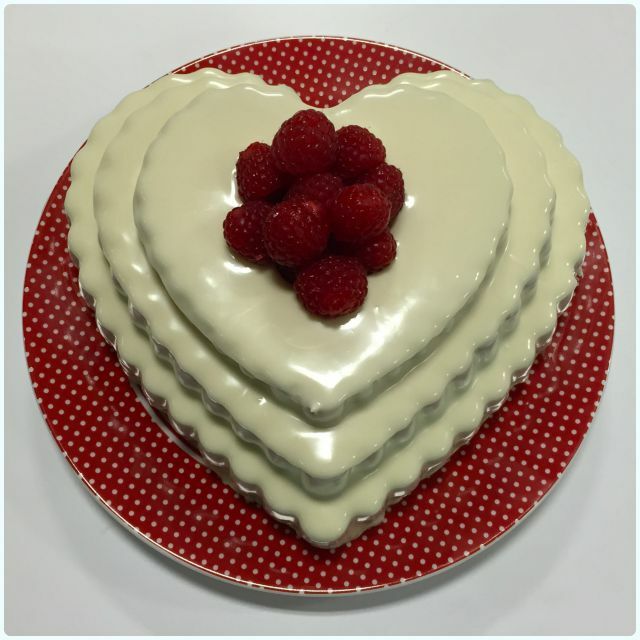 I made mine in the new Nordic Ware Tiered Heart pan, which was very popular at work! Mine lives on the wall in my dining room as it's just too nice to hide away. 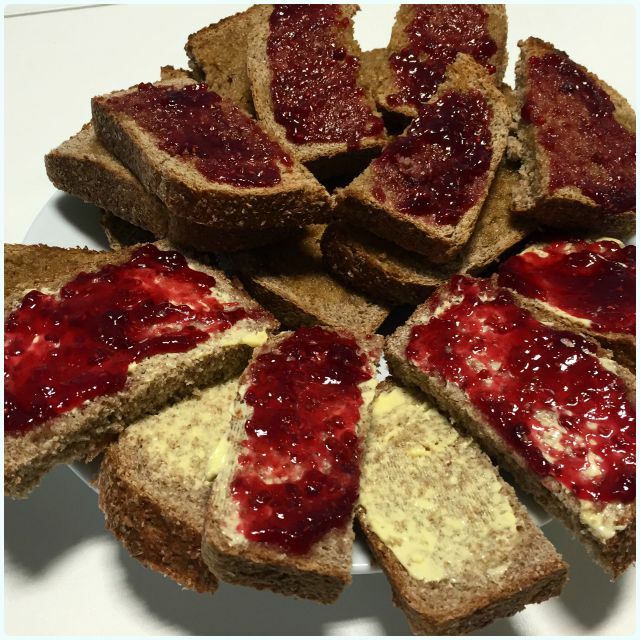 Spread about 5 heaped teaspoons of jam over the mix in an even layer. When completely cool, warm your white chocolate spread in the microwave until slightly runny and tip over the cake. This here cake hit both criteria. 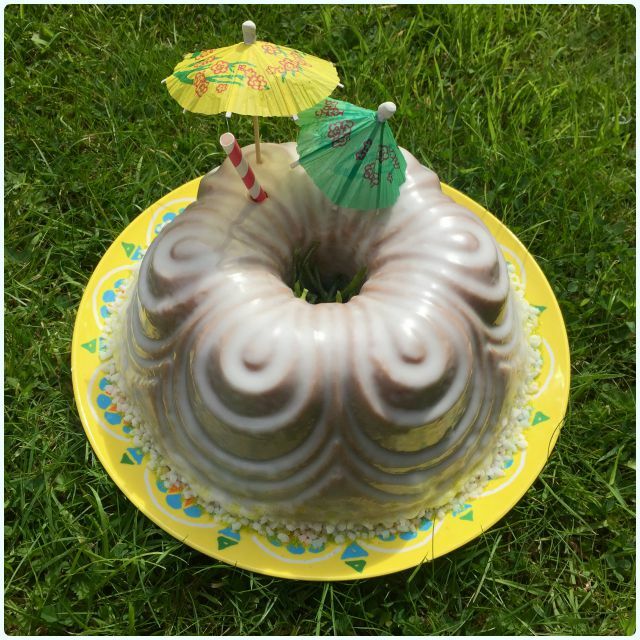 My lovely friend Lee's dad is a fan of the bundt. Who's dad isn't to be fair? I'd taken him a slab of my Chocolate Honeycomb Bundt Cake the other week, which had set his mind thinking of what other cakes I could concoct. I told him to think of anything, and I would deliver. My brief? A margarita cocktail flavoured bundt cake. I relished this challenge! Pour the yoghurt into a jug and mix in the lime juice, zest, orange extract and tequila. Sift in a third of the flour mix followed by half the yoghurt mix. Remove about 6 tbsp of the mix and add a little green food gel. Pour half of the plain coloured mix into your prepared tin. Cover with the green mix. Top that with the rest of the plain mix. 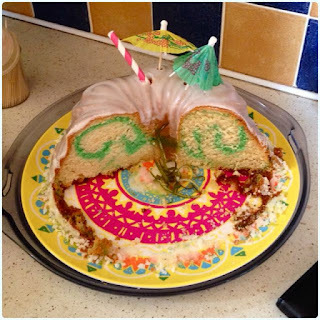 When completely cold, mix the icing sugar with enough of the ready made margarita cocktail to make a runny glaze, and tip over the cake. Just before serving (and ideally whilst the icing is still slightly wet), pop a few sugar pearls around the base of the cake, just like you would coat your margarita glass rim with sugar. 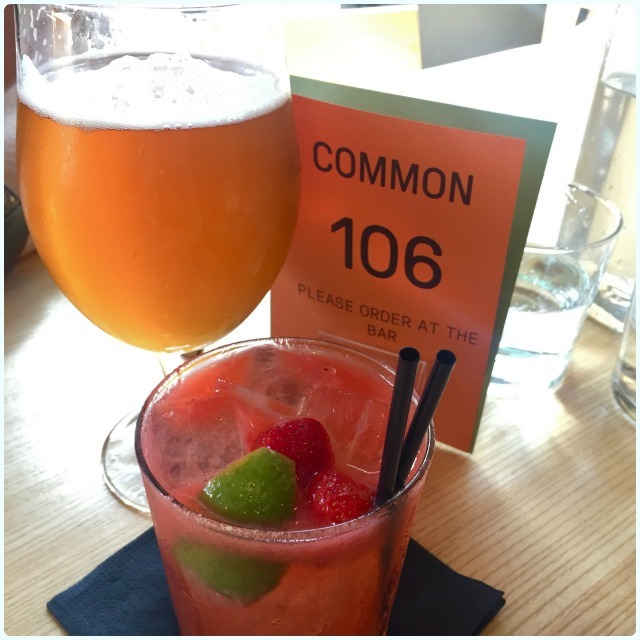 I last visited Common when it had just reopened after a fairly significant facelift. Gone are the graffiti covered walls treasured by every hipster and his (cool) dog, in favour of a more grown up Scandinavian style dining area with cool lampshades. The bar is much bigger now too, meaning you can actually get served without fear of brushing against someone's carefully coiffed beard. I went with my homie Phil on Friday to sample the new dinner menu. Intrigued by the pictures I'd seen of the 'small plates', we ordered a decent mix of nibbles and bits, which when combined were enough to leave us feeling a little left of slumberous. It was hot as hell outside, and the large dining room windows were fully pushed back to invite in a gentle breeze. 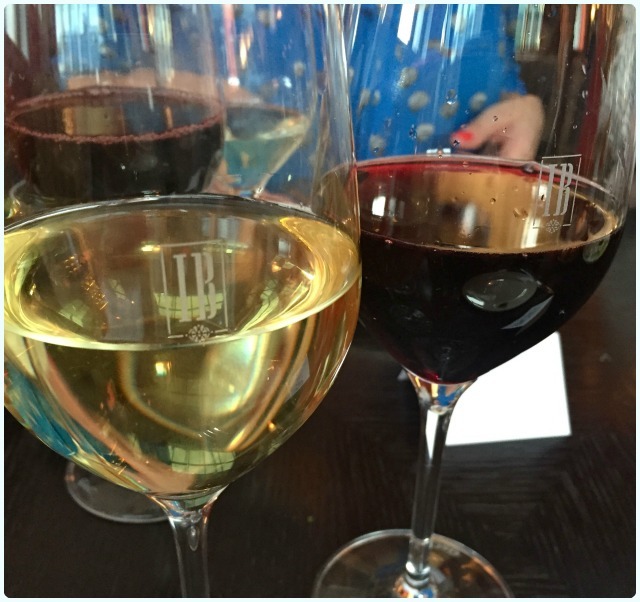 What better way to start the weekend than with some lovely drinks? Phil went for a half of the Mikkeller sour they had on draught, and I opted for a beautifully refreshing strawberry mule. 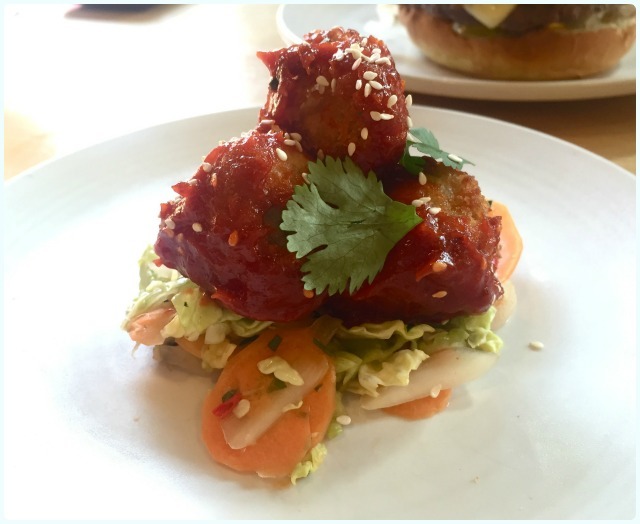 Korean Fried Chicken - Gochujang sauce: Sweet and sticky yet slightly hot, served on a bed of kimchi slaw. I'll get onto that in a bit. 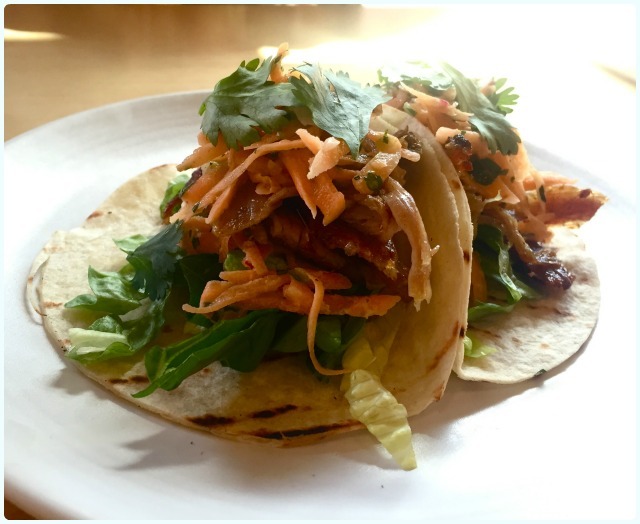 Spiced Lamb Taco - carrot, tzatziki: I could eat a big pile of these - I'm glad I didn't as it would have scuppered everything else. 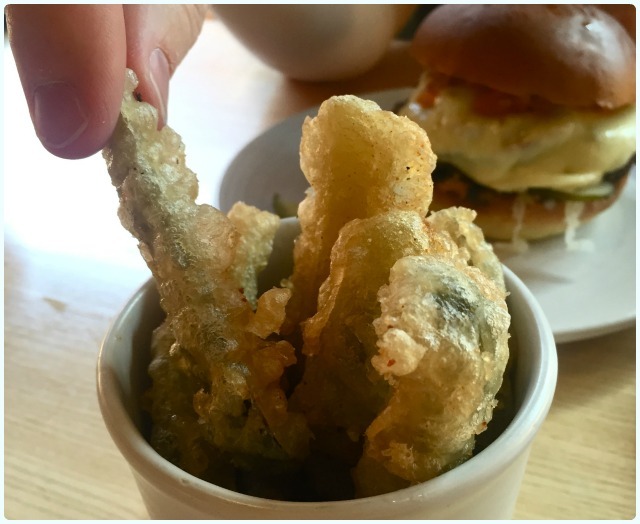 Deep Fried Pickles: Really sharp with a crunchy batter; I loved these deep fried pickles because they retained their crunch. 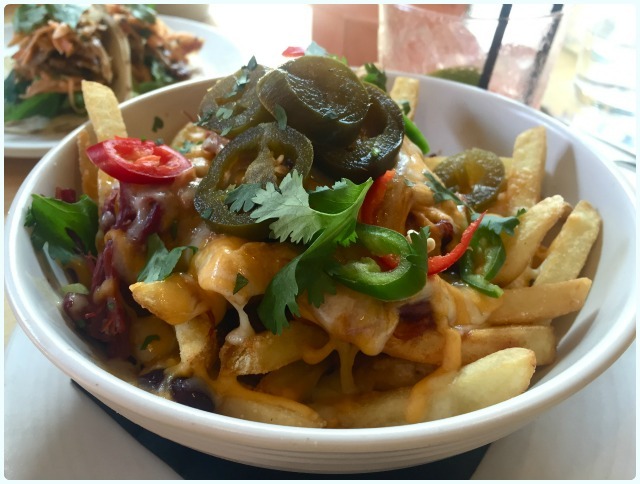 Beef Chilli Fries - cheese, jalapeños: Seriously good. No, 'upsettingly' good. These were like your standard 'nacho fries', but had the added joy of pulled salt beef thrown into the mix. 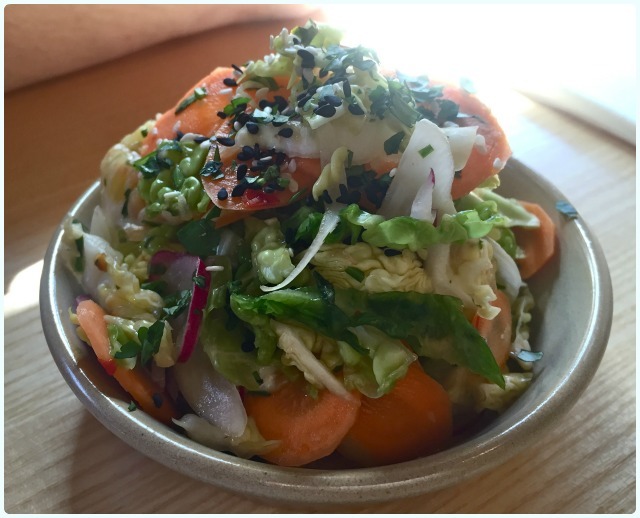 Kimchi Slaw: Looks like a pile of veg, but had a delectable sweet zinginess about the stuff. Genuinely made me joyous. Who would have thought that a bowl of stuff that's good for you could bring so much happiness? 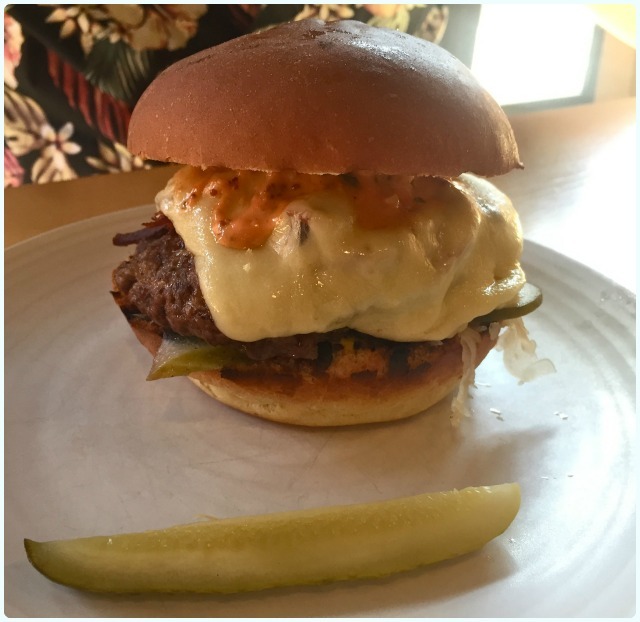 Reuben Burger - salt beef, emmental, sauerkraut pickle: There was nothing that I did not love about this burger; served pink, lots of cheese, pickles and more of that salt beef. I'm ordering this again. Passionfruit Caipirinha - Sagatiba Velha Cacaçha, gomme, lime wedges, fresh passionfruit: I really couldn't choose between the cocktails, so I gave our barman a brief - 'fruity'. 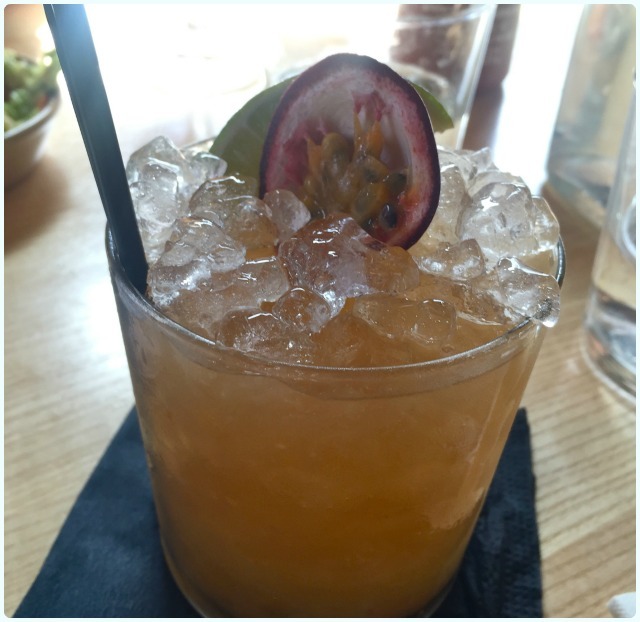 He came back with this passionfruit caipirinha, which was like liquid sunshine. I urge you to try this. Fluffer Martini - Passion fruit, Chase Vodka, passionfruit gomme, prosecco: And then this one... more passionfruit, but this time mixed with a bit of fizz. Very refined. Then they went and called it 'fluffer', and made me laugh. 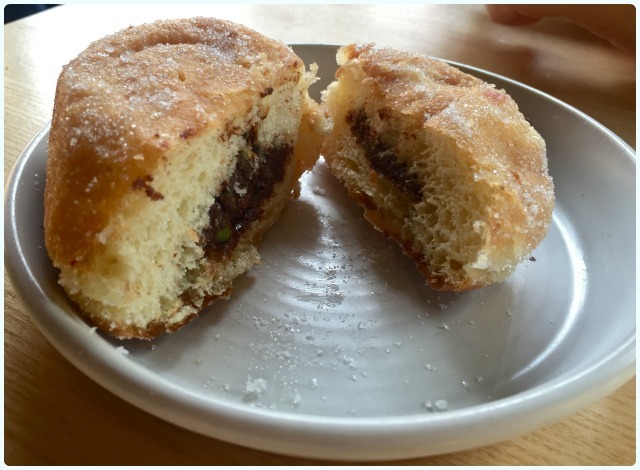 Chocolate and Pistachio Doughnut: We couldn't go without getting my doughnut fix. Homemade on the premises by talented house elves, these doughnuts are the closest thing I have found to the legendary St John articles. Each day brings a plethora of new flavours to try too. This was packed with dark chocolate and pistachio. Disclaimer: I was invited to Common to try their new dinner menu. 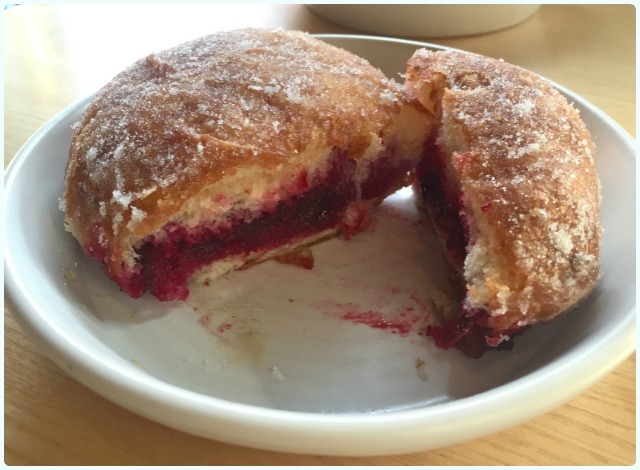 I was under no obligation to say anything nice, to like the dogs sat outside, chat to the waitress like we'd been friends since primary school, or scoff their doughnuts. Also, I made the house elf thing up. I have no idea if they wear pillowcases or not. I suspect not. 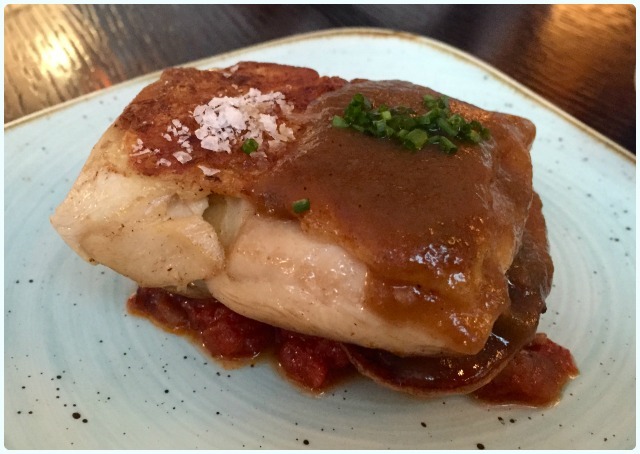 Iberica is one of my favourite new places in Manchester. 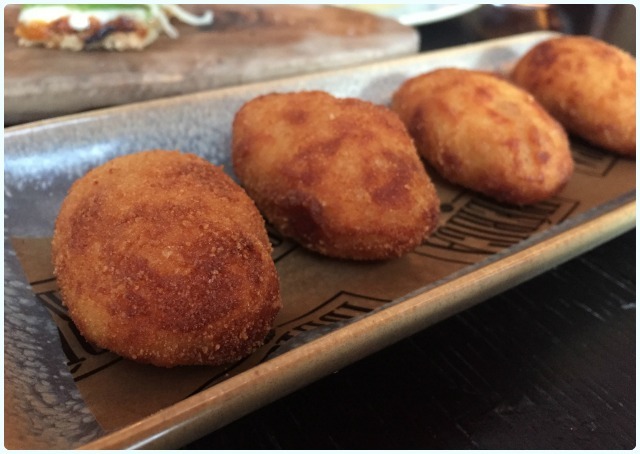 Back in March we visited the Marylebone restaurant whilst we were in London for my birthday, and were quick to sample the new Spinningfields site on our return. 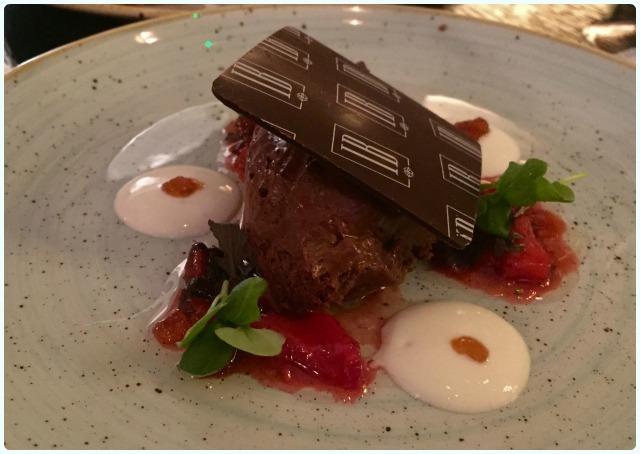 When the folks at SquareMeal asked if I'd like to come to try the new menu and have a catch up with some other local bloggers, I couldn't wait! I took my blogging partner in crime Lee, who has been with me on both of the other occasions, so is pretty much an Iberica professional these days. 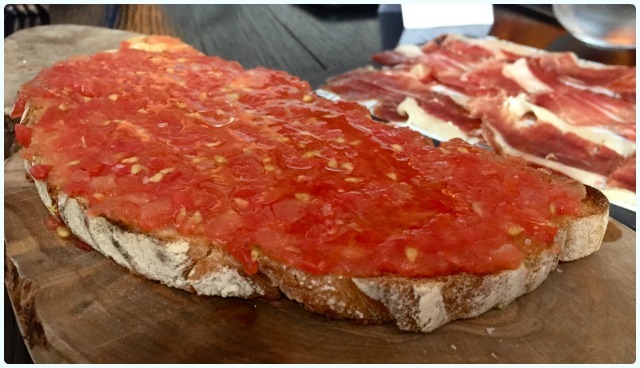 The best part of tapas style food is the ability to share it with friends, and this little close knit group was no exception. Lee and I were joined by fellow bloggers Peter (The Hungry Manc), and Bob and Ciara (Where to Feed), as well as the delightful Ele and Neil from SquareMeal who hosted an evening full of food, wine and much laughter! 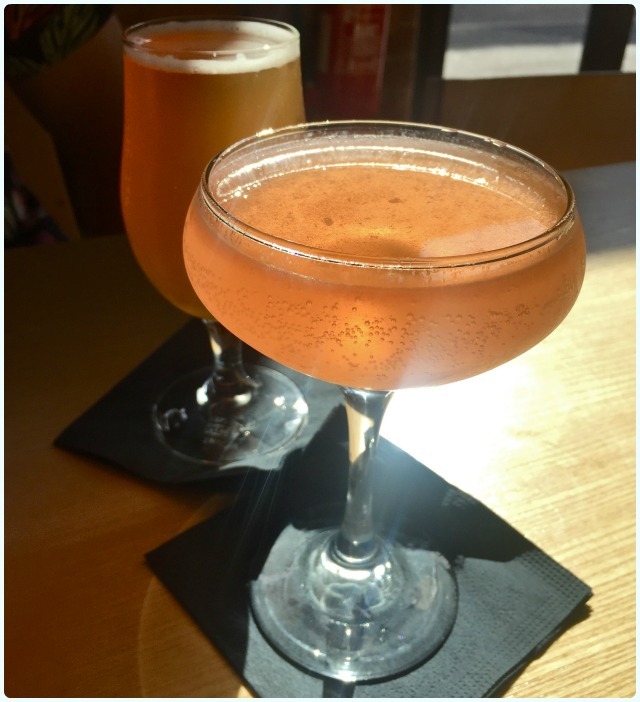 It was a beautiful evening in Manchester, so Lee and I had already frequented Neighbourhood for a few fancy cocktails. We were greeted upon arrival at Iberica by Ele and Neil, and a large fruity sangria. 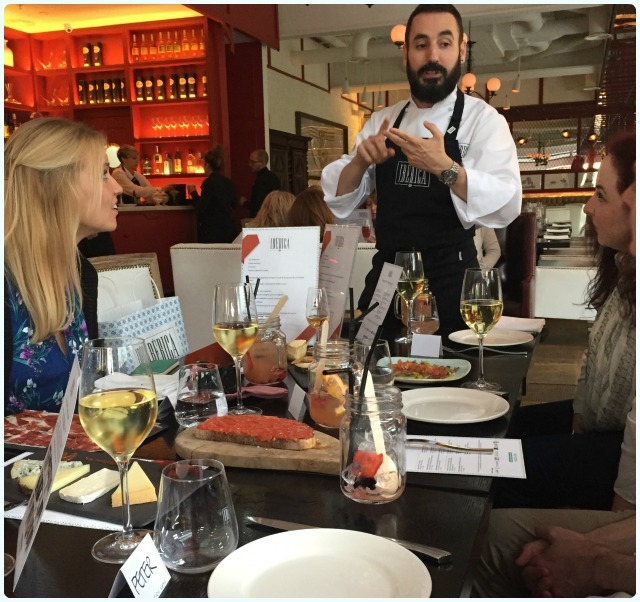 Group Head Chef César García accompanied every course, with a delightful explanation in excited detail. Lee was utterly convinced he was in fact a Spanish 'Mr Selfridge'. I can neither confirm nor deny whether he does this on the side. Toasted bread with tomato: I'm not sure how they got the tomato flavour to be quite so intense. This brought back happy memories of visiting 'Uncle Tom's' greenhouse as a child (Uncle Tom being my grandparents' neighbour). 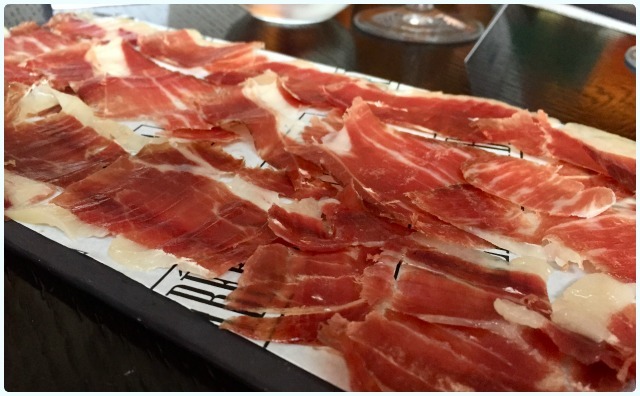 Trio of Ibericos: There were three types of Iberico ham here, all with a unique flavour. Cheese selection: Jeepers. These cheeses ranged from mild and creamy, to the type that stings the roof of your mouth in that wonderful way that only a good gloppy cheese can. Lee described the selection as 'heaven'. She likes her cheese that one; I've witnessed her cane a full block of creamy Lancashire with ease. Mahón D.O.P. - Raw cow's milk cheese with an acid and salty flavour. Tous del Tils - Raw cow's milk cheese with a creamy flavour and a lactic touch. Urgell D.O.P - Cow's milk cheese with a tender texture and smooth taste. Ibores D.O.P. Pimentón - Goat's milk cheese rubbed with paprika. 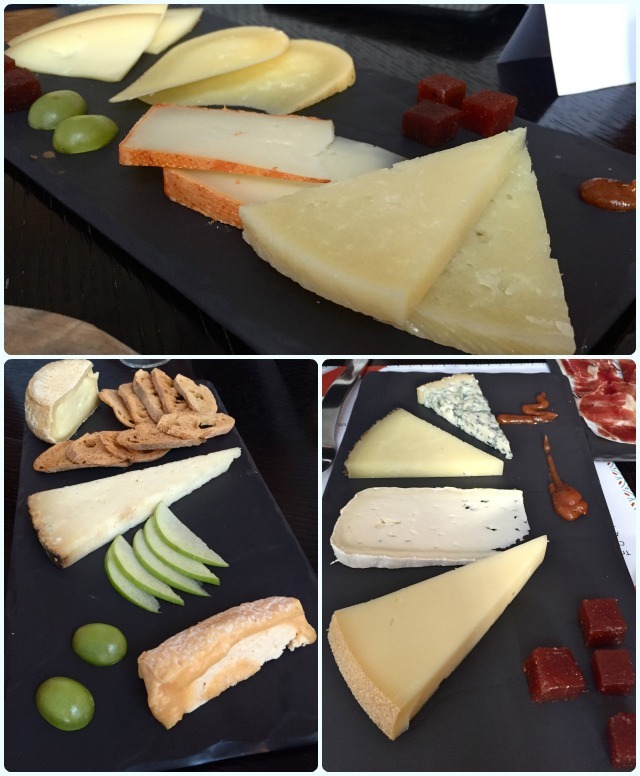 Manchego D.O.P. 12-14 meses - Raw sheep' milk cheese, intense flavour and long savoury finish. Gamoneo "Sobrecueva” - Cow, goat and sheep’s milk cheese with a strong flavour and slightly smoked. San Simon - Cow's milk cheese, mild and fluttery flavour with a smoky undertone. Torta de Trujillo, Finca Pascualete - Organic sheep’s milk cheese, smooth and creamy texture. Rey Silo Pimentón - Cow's milk cheese with an intense flavour and notes of cream, spice and butter. 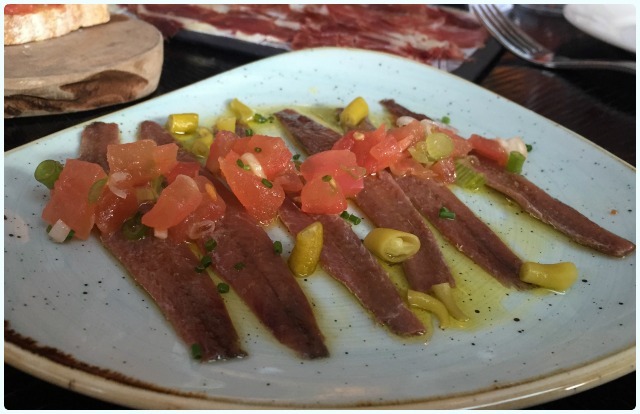 Anchovies: Anyone who reads my blog regularly will know that fish is not my strong suit. I was brave. Although I only sampled one piece, this was deliciously salty without being too fishy. Wine: To be honest I have no idea what the wines were, I just know that they were perfectly matched to the food we were sampling. 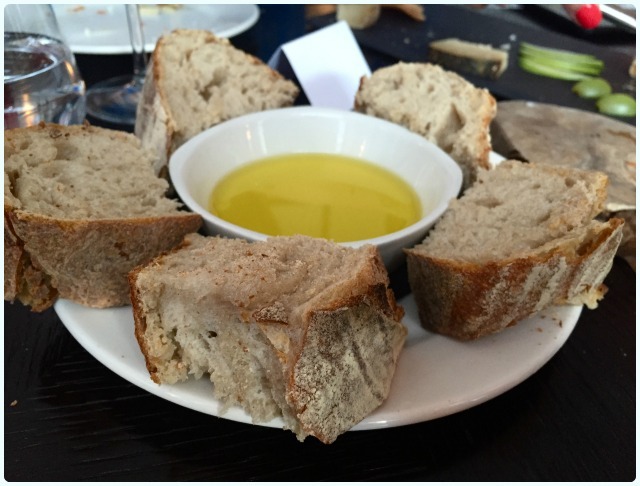 Warm bread with olive oil: I'm a sucker for warm bread. A firm crust of soft crumb; this was perfect when dipped in the Salmorejo (below). 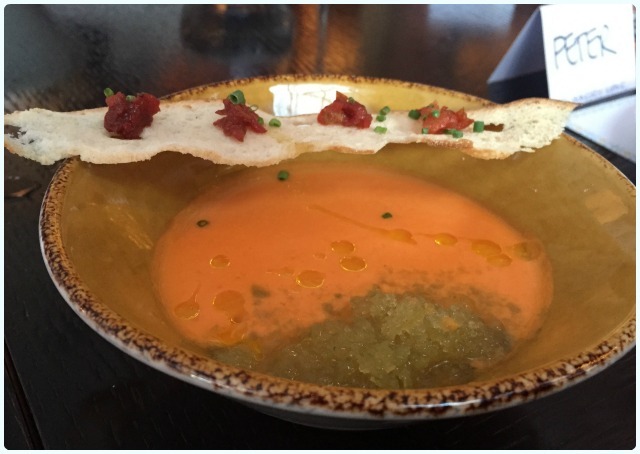 Salmorejo (thick gazpacho) with green apple and basil granite and sun blushed tomato: Sweet tomatoes served with tart apple and basil granite. I can only liken this to a walk through a Spanish garden in summer. Delicious. 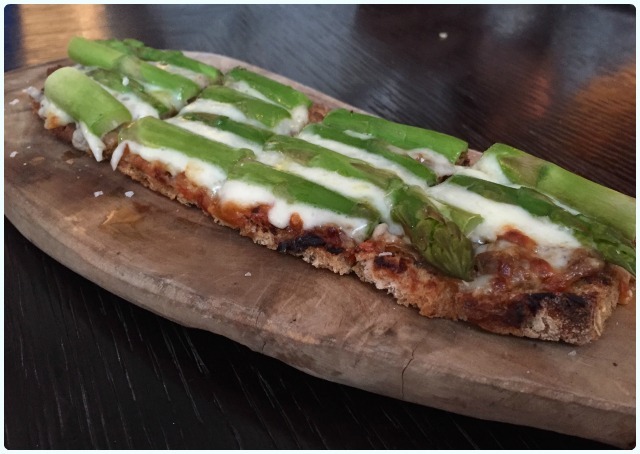 Asparagus, manchego, onion confit and truffle oil toast: The last time we visited, this was my friend Clare's stand out dish. I left this one to Lee as I can't eat truffle oil, but it was given a glowing report yet again. 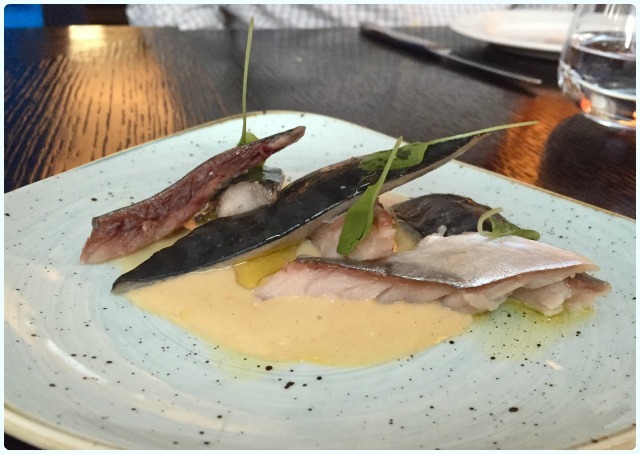 Fresh mackerel with orange and saffron escabeche: Once again, I ate fish an saw that it was actually lovely! This came as quite a shock to a life long fish-hater. 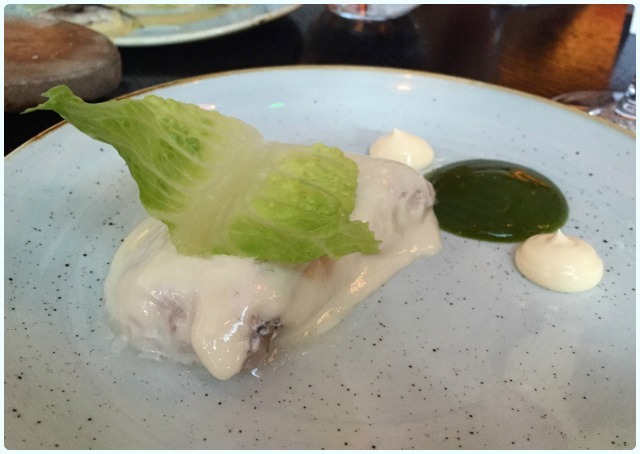 Fresh hake with hollandaise sauce and lettuce water: Oh that beautiful hake in hollandaise. Fresh and creamy and everything that confirmed my hatred for fish dishes has gone out of the window. Fish fact for you - hake makes me laugh as it's 'colin' in French. All hake are therefore called Colin when I see them on a menu. Childish, I know. 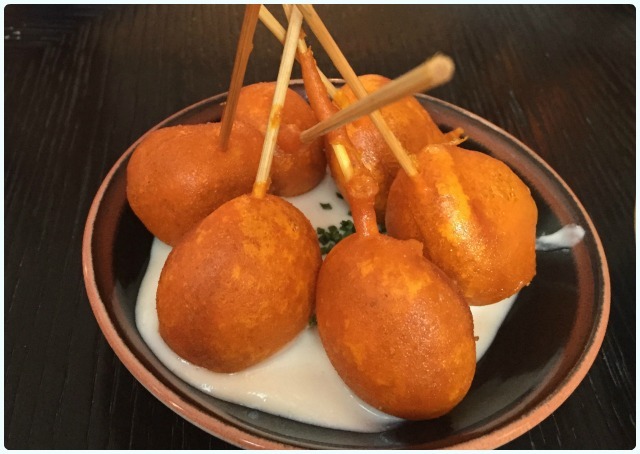 Fried chorizo lollipops: That's right; a chunk of chorizo battered, with a stick in it. Pop it on a pile of aioli and you're laughing. One of my favourite dishes on the menu. 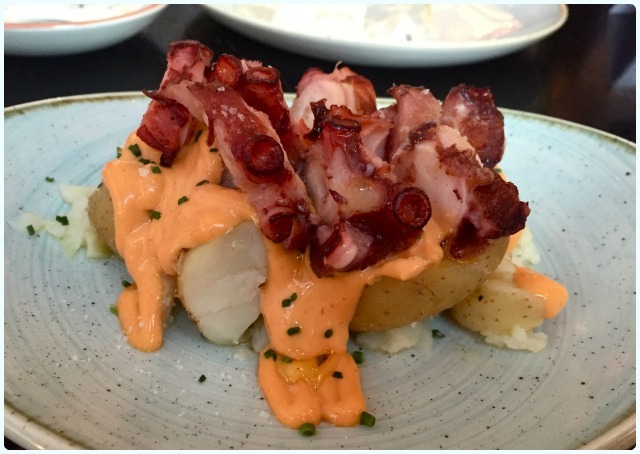 Octopus a la gallega with potatoes and pimenton de la Vera: Lee's little face when a tentacle was placed a foot away from her nose... She was terrified of trying it, yet declared it 'so beautifully cooked' that she really enjoyed it. It was meaty in texture without a hint of toughness. That pimenton de la Vera is something very special indeed. Chicken with chilindron sauce and rosemary potatoes: Imagine if you could condense the smell of roast chicken into something ten times as potent - here we have it. It smelled delicious, and tasted just as good. Mixed grill of 100% Iberico pork prime cuts from Pais de Quercus: We were at that point... the point in any tasting menu where you're feeling a bit beat, only for someone to declare that the main meat course is about to arrive. 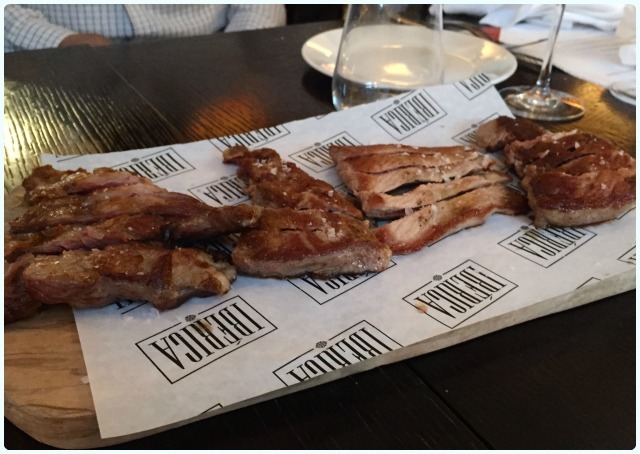 Four different types of pork, full of flavour, moist and beautifully tender. It left us destroyed. 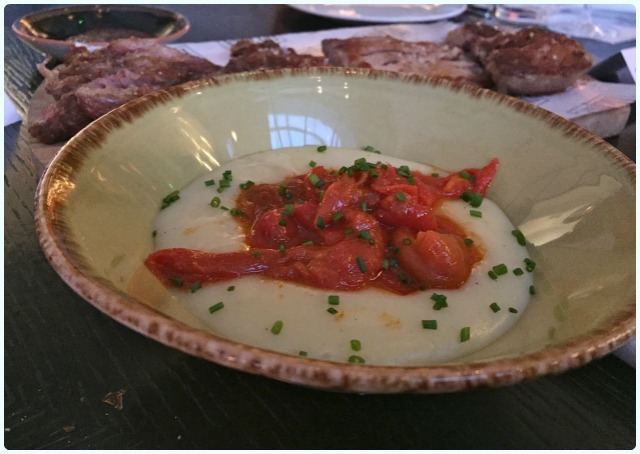 Creamed potatoes with tomato: These weren't even mentioned on the menu, but accompanied the pork. I'm convinced there must have been more butter than potato in this little bowl. Chocolate mousse with herbs cress and red fruit salad, yoghurt, vanilla oil and cider gel: Lee had declared herself almost out at this point, but perked up when she saw this beauty! I didn't try this one as I was saving myself for the churros. 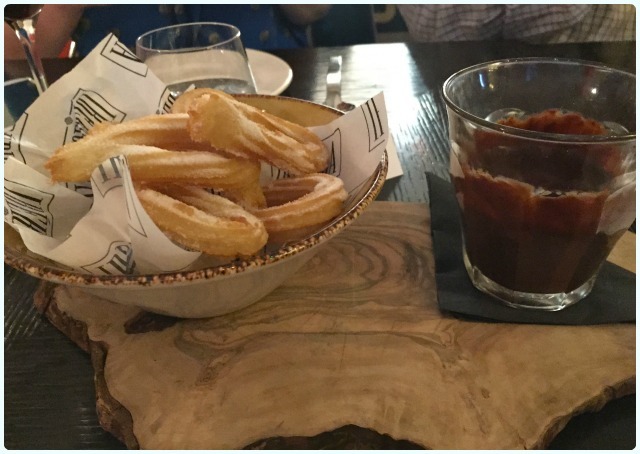 Churros con chocolate: One of my favourite things in the world; hot churros dredged with caster sugar. Pour some sugar on me. I was in heaven. 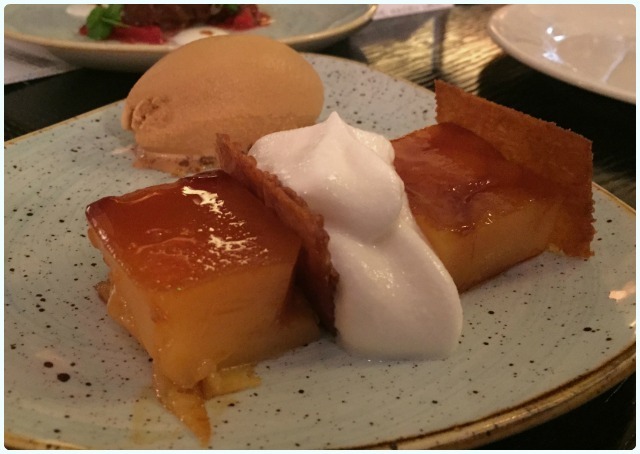 Tocinillo de cielo - egg yolk custard flan with cinnamon and lemon zest milk foam and salted caramel ice cream: This is a traditional Spanish dish which is a bit like flan and a brown sugar tart. Surprisingly light and not ridiculously sweet. Our evening was wrapped up with lots of laughter (mainly aimed at some of the ridiculous entries in my diary when stolen by my husband and friends...) and chatter about our favourite restaurants. 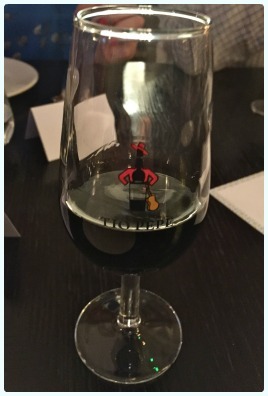 It was a lovely little group, and I think we would all agree that it was an absolute delight to be in the company of like minded people, whilst enjoying some wonderful food and wine, where so much thought had been put into the menu. A massive thank you to all who organised the evening at SquareMeal, to our company for such glittering conversation, and of course to Lee for being my date. This was food to talk over. Let's not wait so long until we do it again!